Researchers have calculated that the energy required to produce bottled water is up to 2,000 times more than the energy required to produce tap water. Image credit: Wikimedia Commons. 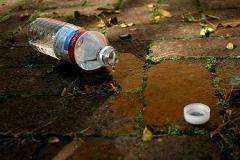 (PhysOrg.com) -- Most people who buy bottled water have access to clean drinking water virtually for free (in the US, tap water costs less than a penny per gallon, on average). Nevertheless, the consumption of bottled water continues to grow, far surpassing the US sales of milk and beer, and second only to soft drinks. Since world consumption of bottled water has increased by 70% since 2001 to 200 billion liters in 2007, some people have become concerned about the environmental, economical, and social impacts of bottled water. In a recent study, researchers Peter Gleick and Heather Cooley from the Pacific Institute in Oakland, California, have estimated the energy required to produce bottled water, including the energy required to manufacture plastic, fabricate the plastic into bottles, process the water, fill and seal the bottles, transport the bottles, and chill the bottles for use. Combining all the energy input totals, Gleick and Cooley found that producing bottled water requires between 5.6 and 10.2 million joules of energy per liter, depending on transportation factors (a typical personal-sized water bottle is about 0.5 liters). That’s up to 2,000 times the energy required to produce tap water, which costs about 0.005 million joules per liter for treatment and distribution. In 2007, US consumers purchased more than 33 billion liters of bottled water, or 110 liters (30 gallons) per person. The total energy required to produce 33 billion liters is equivalent to 32-54 million barrels of oil (although not all the energy used comes from oil). Energy to produce bottled water accounts for about one-third of one percent of total US energy consumption. To break down the energy requirements, Gleick and Cooley found that producing the plastic bottles and transporting the bottles greatly dominated the energy input. Most single-use plastic water bottles are made out of polyethylene terephthalate (PET), recognized in the US by the recycling code “1” imprinted on the bottle. Large containers are more likely made of polycarbonate, which requires about 40% more energy to produce than bottle-grade PET. Although some companies are experimenting with producing lightweight bottles, the researchers calculated that the manufacturing cost of PET is about 4 million joules of energy per typical 1-liter PET bottle weighing 38 grams, and the cap weighing 2 grams. Even though using recycled materials could lead to some energy savings, almost all plastic bottles for water are currently made from virgin PET. “Our previous work had suggested that bottled water production was an energy-intensive process, but we were surprised to see that the energy equivalent of nearly 17 million barrels of oil are required to produce the PET bottles alone,” Cooley told PhysOrg.com. In their analysis, Gleick and Cooley evaluated three different transportation scenarios, and calculated the energy requirements per liter of bottled water. For purified water distributed locally by truck within Los Angeles, the total transportation energy is about 1.4 million joules per liter. In the second situation, spring water shipped from Fiji (such as Fiji Spring Water) across the Pacific to Los Angeles, and then delivered locally by truck, requires about 4 million joules per liter for transportation. Third, spring water transported by truck from French springs (such as Evian) to French sea ports, then shipped across the Atlantic, transported by train from the east coast to Los Angeles, and then delivered locally by truck has a transportation energy cost of about 5.8 million joules per liter. For the two spring water scenarios, the transportation energy equaled (in the case of Fiji) or exceeded (in the case of France) the energy required to produce the bottle. The energy required for processing, bottling, sealing, labeling, and refrigeration were much smaller than the energy for making the bottles and transporting them. With this data, the researchers hope that future studies will have the ability to make specific estimates for different scenarios, and possibly find ways to cut energy costs. “With the US consumption of bottled water exceeding 33 billion liters a year, and with intensifying efforts to reduce energy use and greenhouse gas emissions, these data should help identify ways to reduce the energy costs of bottled water and may help consumers themselves make more environmentally sustainable choices,” Cooley said. More information: Gleick, P.H. and Cooley, H.S. “Energy implications of bottled water.” Environmental Research Letters 4 (2009) 014009 (6pp). Bottled water is such a dumb idea. If it weren't so bad for the environment, I wouldn't mind the mindless consumers of America being gypped of their money. Next thing you know, they'll have "Mountain Fresh Bottled Air...bottled at the source in the Rocky Mountains" or something.. I have no problem with drinking filtered water - I don't believe tap water is the best thing we can be drinking. However, people need to start filtering it THEMSELVES. Invest in a freakin' reverse osmosis filter, already - and stop burying this planet in plastic and air pollution. I have nothing for or against bottled water. I generally stay away from it because Im cheap. But bottled water became fashionable by and because of leftists. Why? Who kept stating how polluted and dangerous our water supply is or potentelly is? Environmentalists. Movie stars, the rich and fashionable (mostly leftists) wanted something better than what the ordinary folks drink. What happened next was that the commoners started liking the convience of bottled water. Now the commoners are condemned. Just like Al Gore et al, keep using their private jets, have their monster manson's, their SUVs, while condeming others for flying coach for a vacation, using a suv to take their kids to soccer, and having a 4 bedroom house. People who will make their money condming water bottles will fly to meeting, drink their bottled water, and write reports against the commoners being allowed the convience. If people want to pay for it, let them have it. It may be a waste of money, but it creates honest jobs, unlike the jobs created by and for those in the environementalist movement. After many years of development, we have a pipe network of clean and very drinkable water directly to our houses. I think it's hilarious that we travel miles to pick up a substance that we can get for pennies out of a tap. I do understand that purified water does have applications (i.e. making gourmet coffee or perhaps in wine making), but I would consider this a special case. It almost seems wrong to expend so much energy on something of marginal benefit in most occasions. Next thing you know, people will be bathing in it. Part of the bottled water choice has to do with trust. Unless you have your own tap water supply, your water is delivered through an unseen network of pipes managed by a bureaucracy, public or private. Therefore every time the main-stream media reports a water quality problem, whether a health risk or not, and the bureaucracy behaves in a manner not in the public interest, this trust in the safety of a most basic element of life is eroded. With bottled water you have a container with someone's name on it to hold accountable if things go wrong. Some corporate and political leaders think they've succeeded when they take their exorbitant salaries, bonuses, and retirements, but what they've really done is corrode the fabric of trust that holds our great country together. Ive not once thought about drinking bottled water because is purer that regular water. I drink it for convenience. I always drink the great tasting tap water up here in Vancouver, B.C., straight out of my bisphenol-A oozing water bottle that has served me well for the last 7 years. I will continue to do so because a) The water tastes great and b) bottled water is expensive/tastes worse. I understand some peoples' tap water isn't as good as the stuff in my city. So, like some above posters mentioned, install a reverse osmosis filter. Do it, or you'll never believe water could taste SWEET due to purity! You people are all missing the point, except for 'freethinking' who gets it. Any group of idiots can come up with ways of 'saving energy', IF FREEDOM IS ALLOWED TO BE VIOLATED, IF GOVERNMENT IS TO MAKE DECISIONS FOR YOU!!!. The leftist dolts think they discovered something,... they didn't, they just have the advantage of not respecting freedom and the constitution (in USA). There is all kinds of things that can be done to save energy and lives, and can be proven effective, ... but at the cost of your personal freedom!! Lets have the government controlled electric company prevent you from setting your air below 78*,... or lets ban driving after 6:00pm to save lives,... or lets forces companies to work a 4 day schedule,.. or etc. You bone heads are fooled by even entering into the idiotic debate,... once these things become an acceptable debate, than the moron left will have government up your a$$, because they are nothing but a bunch of do-gooder naive dolts. You will have a group of half wits in the gov thinking their clever going over statistics finding ways to make decisions for the masses removing one right after another. Their is zero wrong with bottled water!,.. it takes energy to make TV's, stereo's, to flush the toilet, to make computers, the list is endless you dimwits! It all creates jobs and allows freedom. If the ignorant left wanted to 'save energy' they would have backed nuclear energy. This energy bs is a scam to change world gov, particularly the USA to socialism. A bunch of mental children, they left are. The 'scientists who do these studies enter an area so wide open ( because normally freedom is respected),.. that even they, as dumb as they are,.. can make 'discoveries'! ... last rant,... there seem to be no adults anymore, ...only children with their naive view of 'what should be',.. completely ignorant of history, and a sitting duck for socialists. Al Gore is a scam artists,.. he uses 200 times as much energy as you do. GW is the greatest scam in history (as taken to mean man made and/or that man could in principal fix it). There is no energy shortage, there is plenty of oil for centuries to come, by which time due to expense alternatives will be developed naturally, not forced into existance. The Hiroshima bomb used less than 1% of two lbs of uranium and fusion is even more efficient,.. there is plenty of energy and time. I refill all my bottles and reuse them for a few weeks each, this has never done me any harm. I do begrudge paying through the nose for the water when all I want is the empty bottle - something I've never seen in a standard shop/supermarket. I'm sorry, but I worked for the Pennsylvania Gas and Water Company for 4 summers after high school and while in college, and when we would repair water leaks you wouldn't believe the disgusting gunk that lined most of the cast iron pipes. The stench in the hole was overwhelming. Nauseating. Since those years I have avoided tap water at every opportunity. Thanks AlGore, you created an army of idiots with calculators. GW is not accepted by any means as a consensus, it is an industry, popular hysertia, political tool, many things, but not a consensus to those not employed in its research. They just don't have proper scientific knowledge about the Earth and Suns climate cycles. My family treats the few bottles of water we buy a year as purchasing another permanent water bottle. Every bottle is refilled with filtered water and put back in the fridge again and again until it is too trashed to re-use. After that, of course, it is recycled. There has always been a need for bottled water and there always will be, everyone just needs to make certain they are using it efficiently. I buy about a case every 3 months to reuse. I've seen some "studies" on reused bottles leeching chemicals over time; but that is not a concern of mine right now. I figure my microwave, car, 80 year old electrical system, cellphone and all other caveats of modern life do more damage than the little bit of plastic I am ingesting. Using a faucet or home filter to refill is much more economical while saving the added convenience of a disposable plastic container. On an added note, the whole AGW debate happening here and other places on the net is not only invalid, but also a red-herring. You're arguing whether or not there is enough oil for decades, or if man is responsible (wholly or in part) for our climate change, OR if we could do something about it. What you neglect to realize is this argument is completely moot, and mostly for very negative reasons. Bottom line is, any polluting industry must be incentivized to not pollute; otherwise we jeopardize the future of our posterity - going directly against the core principles of government's social contract - namely ensuring the sanctity and security of the commonwealth (via Life, Liberty, pursuit... etc.). So the argument then becomes, not one of placing blame or slinging false-accusations (pro- and anti- AGW alike) based largely on subjective opinion and anecdotal science; but one of how to constructively improve ourselves and our modality of environmental impact (and further understanding of self and happiness) to set a good example for our kids. Ever heard of "leave no trace?" If you had, you would show a greater reverence for nature, and understand your invested interest in maintaining and conserving everything we can. This is not left-wing do-gooder naivety. It's common economical and scientific sense. In line with the laws of physics, the natural conservation of energy, and thermodynamics. Something abandoned by most opining blow-hards on the web and in the MSM. Well, you can't deny physics. Either we fix it ourselves, or it will be done for us - without the convenience and expediency of discriminatory action. BTW, when has a consensus ever been right? Look at the foundation of US government. It is specifically designed to undermine the mob-mentality of the "general consensus" through division of shared responsibility. Keep diluting yourselves and your argument, and your accusations (on both sides) of Al Gore and other AGW BS may just become a self-fulfilling prophecy. I guess that none of you guys ever saw that show that exposed the bottling companies that are filling those plastic bottles right out of the tap. So you are paying someone to do something you could do at home for basically nothing. Buy a PUR water filter. Tastes great, less filling. Wow, a lot of 'debate' and yelling over this simple study. There's nothing to debate here, the findings are obvious and simple. If you can have the same thing in two different ways, one more energy efficient than the other, then by going the energy efficient route you're taking stress off of the environment. That energy comes from somewhere, and while we don't have nuclear reactors powering the country, we need to be mindful of our energy usage as it comes from sources that pollute the environment -- an environment that each of us directly depends on, regardless of our political leanings. It has been shown on many occasions (scientifically - not by left wing nuts!) that chlorine is carcinogenic. Neither chlorine, hypochlorite ions or any other breakdown products are known or even suspected carcinogens. Large, long-term animal studies have been performed using chlorinated water and the result is diddly squat. Pray tell me how you can justify this bit of data. The burden of proof is on you; you're the one claiming a contrary result to the vast body of scientific evidence on chlorinated tap water. Anyone tell you that you sound like an ignorant nut case? With the spate of very recent studies that detail the amount of pharmaceuticals contained in domestic water supplies, I'll keep on drinking it. I originally stared drinking spring water because I think it tastes much better than tap water, however, I now have a better reason, no pharmaceuticals. While I think that the intent of this study was to call attention to the energy use of bottling water, I think it unfortunate that it seems to neglect other issues surrounding the consumption of spring water. IMHO, drinking bottled filtered tap water makes no sense since you can filter and bottle it yourself. Spring water, OTOH, is a different story. Know what you mean Noumenon, nanny states slowly removing our freedoms is a pain in the a$$ indeed. We can only be amused by people lugging their "designer" bottled water in their so very politically correct canvas shopping bags. Rants. Ignorant pseudo-science. Political ideologies. I don't understand why someone has not brought up religion and terrorism! I would like to mention the article at the top of this page, if nobody else minds: the one that does not discuss the content of bottles of water, but does discuss the cost of producing the container. You know, those trendy glass bottles in a variety of shapes and colours for you to collect and use as ornaments (and ignorant politic statements) around pretentious homes. Glass is a heavy material. Cost of transportation alone should have proved prohibitive, but you continue providing money for those bragging rights: I can afford it; I have the lifestyle of the beautiful and famous. Plastic bottles are much lighter, the transportation costs drop far away from glass counterparts, unless you look at the growing market for 'sports bottles', (which should not deserve further comment). However, as the average internet connected armchair science commentator knows, plastic is an oil product. So while you hide your SUV in the garage for special occasions and take to the electric car, you are still using oil in your water drinking behaviour. Recycling? Whether glass or plastic, recycling helps to reduce the amount of your life buried in the ground for future (very confused) archaeologists, but the process of turning a voluntarily submitted product - such as a bottle - back into a raw material to be used again - for another bottle perhaps - uses oil. Recycling does not reduce oil dependency, and it does emit a significant amount of gases during the process. So, you don't trust the content of the water pipe? Form a group, go and ask your water supplier for an accurate account of what they supply in your water, and why - and then test that the water in your home matches what they tell you. Conspiracy theories about water delivered drugs are partially true, no doubt about it. But you need to know what drugs and why they are there. And then, if your group disagrees with the cocktail being served, talk to your local politicians and lobby for a change, instead of talking to your supermarket manager about what he can sell you (this week). Freedom comes with responsibility. Choose well.